I am pleased to see my work from this trip in print. Kamchatka is one of those places I will always want to go back to. Check out the photo essay on fly fishing Russia in the January/February issue of Sporting Classics. Head down to your local shop and grab yourself a copy, or better yet, order a subscription — you won’t be disappointed. This issue is packed with great articles and content. Not to be missed! I couldn’t be more happy to see this article getting picked up by Conde Nast Traveller. Dubai is an amazing place full of wonder and adventure. It’s also a fantastic place to toss a fly for queenfish! 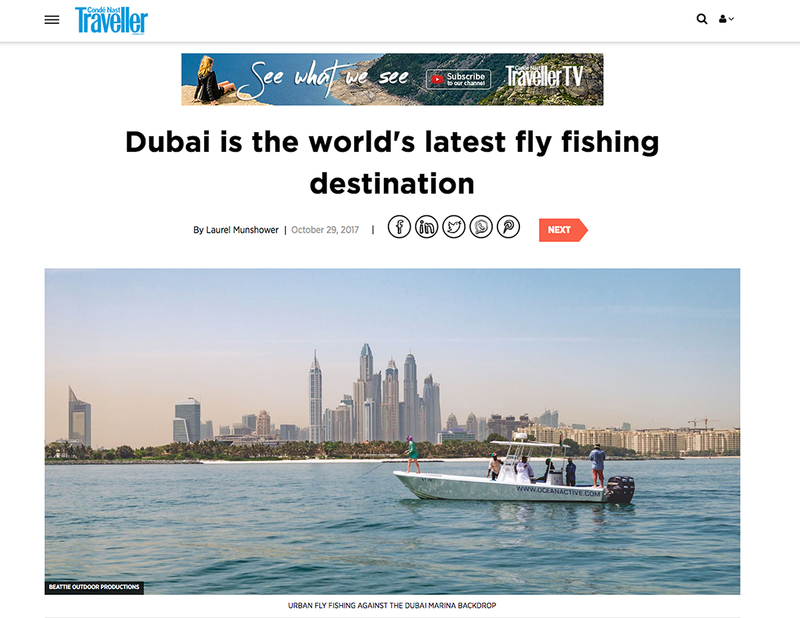 Click on the link, book a ticket and go see what Dubai and queenfish have to offer. Great work, team! It’s great to see this image of a blue trevally as the lead off image for Miles Nolte’s article “Quality in Paradise”. The blue trevally is quickly becoming a favorite of mine to both fish for and to photograph. Robust and feisty, full of colors and patterns, they never disappoint the angler or the camera. This issue is packed with great articles and impressive essays, it’s not one to be missed. Be sure to head down to your local shop and grab yourself a copy or better yet, order a subscription, you won’t be disappointed. The Senanda River is mousing heaven if I’ve ever seen one. It’s not the fishing that draws me back here, it’s the overall experience. The landscape, the camp fires, the people, the food, the wildlife and then, of course, there is the fish. It was incredible to see a forest that is still relatively untouched and truly wild. Big thanks to Tom, Alejandro and James for letting me tag along with my camera daily. This issue is packed with great articles and some impressive photo essays, it’s not one to be missed. It’s great to see this image in print. Big thanks to Rick Matney for always getting it done in clutch situations. Don’t have a copy of the new mag? Head down to your local shop and grab a copy, or better yet, get a yearly subscription and never miss an issue …. support print magazines!